As discussed in a previous post – most people are more afraid of speaking in public than death! If you want to know how to appear confident, poised and nerve-free – read on! So what is the solution to “appearing” confident and nerveless? Simple! Just “pretend”you are! Sorry if you were expecting a miracle “cure” for nerves – but this technique works just as well! The good thing is… “pretending” you are confident can get you through a seemingly difficult speaking engagement – and the more you pretend, the more you will learn how to do it for real! The audience will not know the difference if you pretend well enough! Here’s how to do it: first of all, watch and study good speakers, especially comedians and entertainers. Watch their body language, see how they have a “swagger” to the way they walk on stage and how this communicates confidence, poise and utter comfort in what they do. They “own” the stage! Malcolm Gladwell in his book “Blink” says we make a judgement about a person in miliseconds…. based on non verbal cues – especially body language. Have a picture in your mind of the way successful performers behave – absorb their characteristics and “model” them! Adopt their confident behaviour and you are part way there before you even utter a word! You may be terrified – but your audience will be fooled into thinking you’re not if you imitate the persona of a confident speaker well enough! Secondly, know your material. I am not describing a technique to make you appear to be an expert in something when you’re not – that would be dishonest! As described further on – it is a method to help you cope with nerves and confidence. In particular – research, write, learn by heart and rehearse the first 30 seconds of what you are going to do so it is flawless and second nature! ! Once you are up and running and the audience has decided you know what you are doing, they will accept you and relax – and so will you! Thirdly, in your pre-event preparation, VISUALISE the talk. See it going well – as vividly as you can. Make it seem real! It has been said the brain finds it difficult to differentiate between a vividly imagined experience and the real thing. So visualise a successful talk – with everyone loving what you do, laughing in the right places and hanging on your every word! Vividly use your imagination to “see” yourself speaking confidently and with total control…. imagine the room, the audience, their reaction, the lighting, the smell, the temperature – everything! Employ as many visual and physical cues as you can. I do this almost from the instant I receive an enquiry for a speaking engagement – often months before! As the date approaches I do it with greater intensity, and when I actually arrive at a venue I go straight to the room and study the layout so I can get my imagination working on a successful performance. Here’s the thing – by visualising a successful speech – several times (the more the better) – you are in effect doing the speech in your mind. This means when you come to do it “for real” – you will have already done it where it has gone “brilliantly” – in your imagination! Thus doing it for real won’t be for the first time! “We possess within us a force of incalculable power, which, when we handle it unconsciously is often prejudicial to us. If on the contrary we direct it in a conscious and wise manner, it gives us mastery of ourselves.” He believed that in any conflict between the will and imagination, that our imagination is always stronger. It is therefore probably true to say that the undeniable power of hypnosis and hypnotherapy have more to do with helping people to unleash the power of their imagination, rather than “mumbo jumbo”. “Mental practice” is a form of autosuggestion, and although it is a well known tool for athletes and sportspeople, it is just as effective for speakers. I find this works especially well just before you nod off to sleep – it primes your sub-conscious to work on it while you slumber! The same applies to when you wake up – in that dozy period before you get up – run through the speech – successfully – and it will seep into your mind as something you know and are comfortable with. Harvard Psychologist Amy Cuddy in her TED talk (the second most viewed of all TED talks) describes how our physiology and behaviour affects our attitude, and can cause changes to our brain chemistry. Her research showed that simply adopting powerful body language can significantly increase the testosterone and cortisol levels in the brain. Cuddy suggests that our attitudes often follow from our behaviours, as opposed to the other way around. That means assuming the body language of a powerful person can make you feel confident. She outlines the concept of the “power pose” – making your body as large as possible, and how adopting a position with arms outstretched for a few minutes before you’re “on” can greatly affect how you feel – and how you perform! What’s more, Cuddy says, adopting the body language of a powerful person changes the way other people see and act toward you, which in turn reinforces your confident behavior. Despite the controversy surrounding her findings (relating to failed “replication” tests carried out by other researchers) I know from personal experience that standing tall, plastering a smile on my face, using expansive gestures and looking the audience in the eye makes me feel good – and feel confident! This communicates to the audience in ways I don’t understand – but it works! You can read Cuddy’s response to the criticism HERE. As Cuddy sums it up: “When our body language is confident and open, other people respond in kind, unconsciously reinforcing not only their perception of us but also our perception of ourselves.” She describes the principle in a variation of the well known phrase “fake it til you make it” – her take being “fake it til you become it” – in other words if you impersonate a more confident speaker by acting the part, you will eventually become the part. The problem with the word “fake” – I feel – is that it seems to indicate a dishonest pretence of competence. Unfortunately … it might just be that you are NOT not in fact suitably qualified, knowledgeable or experienced enough for the task in hand! In which case I’m afraid no amount of positive body language can give you expertise! You must study, research and “know your subject”. This was addressed by author Roger Hamilton in a blog post called “Fake it until you make it.” – Why is this the worst advice EVER? However I feel this is to misinterpret what Amy Cuddy is saying. Her advice is more to do with acquiring confidence in the delivery of material that you already have knowledge of and are competent to present, as well as to give you confidence in stressful situations such as job interviews where you have the necessary skills for the job – but may lack the chutzpah to convince an employer of this! He attributes the origins of the “fake it” principle to a quote by Aristotle, who observed that “Men acquire a particular quality by constantly acting a certain way” – if you’ll forgive the inherent sexism of the Ancient Greeks! In another take on the subject Aristotle also famously said “we are what we repeatedly do”. American psychologist William James was the first psychologist of the modern era to describe how behaviour and actions influence mood, describing it as the “As If” principle. Namely – behaving “as if” you had the desired qualities you would eventually assume them – which is exactly what Amy Cuddy is saying! This was also developed by Richard Wiseman in his book “Rip It Up“. The effects of powerful body language are further examined in Amy Cuddy’s brilliant book “Presence” – where she elaborates on the “power pose” concept outlined in her TED talk mentioned above. Despite the controversy surrounding the significance of her findings… if it works – it works – and that’s good enough for me! Here are 3 recent screen captures from my TV of some British performers who have either read it – or are adopting their Power Poses naturally! From Top Right going anti-clockwise: Russell Kane, Miranda Hart, Jimmy Tarbuck …. plus… from my archives – me!! I am glad I am practicing what I preach! Want to speak with confidence? Try it! Are you a speaker who has experience of “coping with nerves”? If so please share your observations in the comments box below! 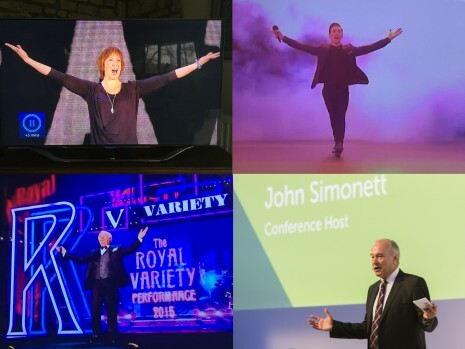 If you are looking for a speaker or conference host to ensure the success of your next event – please get in touch! Next post: Ronnie Corbett: Lessons for Speakers Musings on hearing of the death of the great Ronnie Corbett in March 2016.